My flight on Saturday was pretty amazing. I drove through hail and sleet in Everett and was amazed to see the sky clearing to the north, when I could see at all, over Arlington. My CFI A –, said it was okay to fly but we’d have to watch the weather closely. There were patches of blue overhead, but storms were moving around to the West and South. Bits of snow were swirling about. My take off was pretty shaky – I still have a bad habit of wandering all over the runway when I’m trying trying to lift off. A — was busy trying to correct my departure with his feet hard on the pedals. Thankfully the runway at Arlington is in the middle of a field because I took off over the grass to the right of the actual tarmac. The important thing was I did take off. I guess I’ll get better. 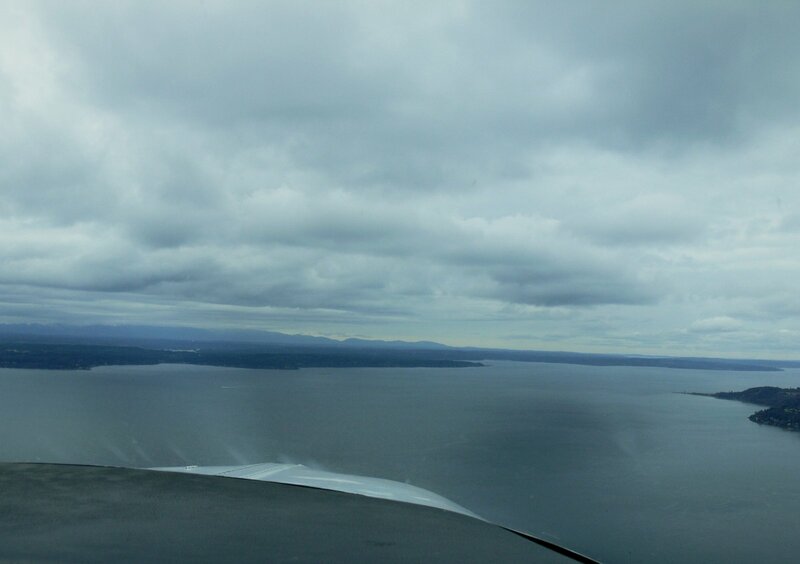 Once in the air, we spent most of the time dodging clouds and finding clear chunks of sky in which to practice. Still, it was spectacular flying up there and looking for holes. A — kept an eye on the field to make sure we could get back. It was pretty overwhelming to not only be at the controls of a plane but also in snow squalls – in the middle of a very active sky. After I got comfortable being in the SportsStar again (as opposed to the 172), flying with a stick and dealing with a much more nimble plane, I did pretty well just flying it. We again practiced slow flight. It’s amazing to just get that plane to hang in the air, nose up, and going 55 mph. I flew that speed for a while and did a number of turns. That part got to be pretty okay. Then A — asked if I wanted to do some stalls. Well, what could I say, I mean that’s kind of the point, you have to be able to do stalls if you learn to fly. Regardless if they scare you. A — demonstrated them. Unlike the Cessna, when the Evektor stalls it just starts to fall out of the sky – and usually yaws to the left as well. He did show me that if I could stay coordinated it would just pitch violently nose down. At that point you have to be a little counter-intuitive and despite the fact the plane is falling nose down you have to push the stick forward to lower the angle of attack. The first thing I did was shoot the power back on when it was my turn, then pushed the nose back down. It was not smooth or correct the first time, but I did recover from the stall pretty fast. I got a little more coordinated the next few times – pitch down, power on, flaps up… and do it all pretty damn quick. Stalling in that plane is like being on a roller coaster – going down fast. So after about an hour the sky began to seriously close up and it was time to head back. “Do you mind if I land?” he said. It had begun to snow even at 3,000 feet. “Be my guest.” I mean what am I going to say? He made some sharp turns actually pulling back the power a bit to make them tighter and entered the landing pattern directly at the base leg flying through the now driving snow. “Promise me you won’t fly by yourself in this kind of weather,” he said with a smile.